A Florida lawyer has announced plans to sue the motorized scooter company Lime for injuries sustained by a rider who is in a coma after being hit by a car in Fort Lauderdale. Lawyer Todd Falzone said in a Monday press conference that Ashanti Jordan, who’s in her late 20s, used a Lime dockless scooter that is available for rent on the streets of Fort Lauderdale using a smartphone app. Three other companies also provide rental scooters in the city. An initial police report said Jordan was injured in December when she ran a stop sign and was struck by an oncoming car, according to the South Florida Sun Sentinel. 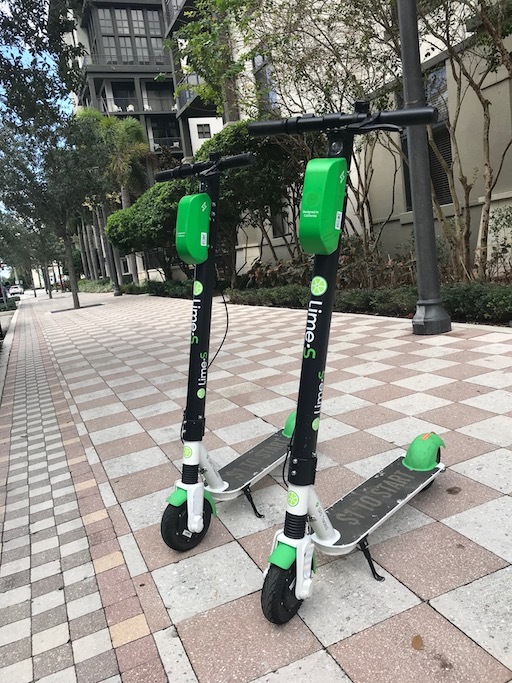 But Falzone puts the blame on Lime for an app instructing users they shouldn’t operate the scooters on city sidewalks, according to the Sun Sentinel and the Washington Post. Although Florida law generally doesn’t allow scooters on sidewalks, it makes an exception for cities that specifically authorize sidewalk use. Fort Lauderdale permits sidewalk use. Falzone is a lawyer with Kelley-Uustal. The firm’s marketing director, Anne-Marie Kopek, told the ABA Journal on Wednesday that the lawsuit had not yet been filed. Three people have recently been killed in incidents involving Lime scooters nationwide, according to the Post. Falzone showed the Post rules and regulations by Lime—which must be agreed to before riders can use the scooters—that say, “Do not ride on the sidewalk.” The app mentions sidewalk use three times, he said, and the warning against sidewalk use is also on the outside of the scooter. In Fort Lauderdale, there have been at least 35 scooter injuries, including four cases involving the most serious “level 1” trauma, according to the Sun Sentinel and Local 10. One of those injured was Judge Susan Alspector of the Broward District Court, who had to have Achilles surgery after a scooter struck her while she was running. Jordan is a patient at the Broward General Medical Center where she had worked as a security guard. She suffered broken bones, rib fractures, a fractured skull and brain injury in the incident. Lime said in a statement that the safety of riders and the community is its highest priority.